In 1977, The Clash dropped their hugely influential self-titled debut album on CBS Records, and it still stands up as one of punk’s most essential releases. With their speedy and reckless yet musically adept political punk rock, The Clash arguably became the most influential punk band of their era. On their debut LP, frontman Joe Strummer took on uncomfortable topics like class warfare and imperialism, and their gritty songs exuded a frantic rage and the spirit of alienated youth. 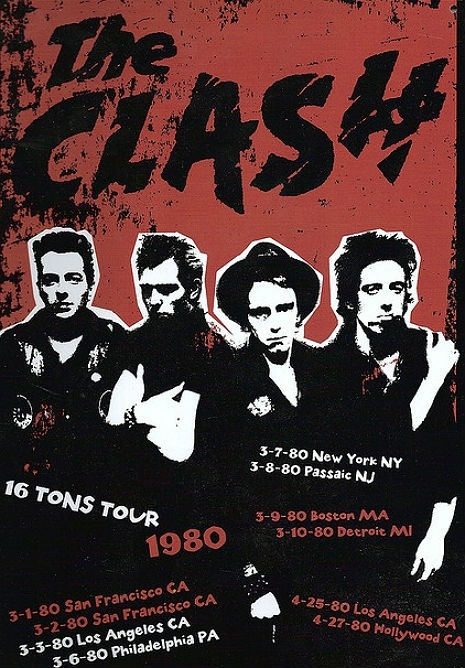 On March 8th, 1980, The Clash performed at the Capitol Theatre in Passaic, N.J. following the release of London Calling a few months prior . That night, the band performed amongst others three cuts from their debut record”Janie Jones,” “Police and Thieves” and “Garageland.” Something strange happened at this show there was a bomb-scare that resulted in a delay while police checked underneath the seats to confirm there was not a problem [Joe adlibs about the bomb scare in Police & Thieves]. The supporting acts included the B-Girls, Mikey Dread and Lee Dorsey. The B-Girls were an all girl new wave band. “In Passaic New Jersey they had an in house video set up. Result: Paul and Topper pointed the onstage camera onto the audience who were arriving and finding their seats. Topper beats out the intro to Janie Jones then a single spot picks out Joe then all the lights come on as the song kicks in and Joe throws his guitar behind him, without looking, presumably Johnny waiting! Joe grabs the mic shouting out the lyrics with Mick and Paul running around the stage, switching sides. It’s electric visually (and aurally) and the highlight certainly of the video. This is a superlative example of the Clash’s ‘16 Tons’ tour. The band is at a peak here, even with a hobbled Topper Headon. Mickey Gallagher’s organ playing added a lot of dimension to the band’s sound, especially on the London Calling numbers, and the band is tight and together. Mick’s guitar sound is particularly impressive here. The Clash perform “Janie Jones,” “Police and Thieves” and “Garageland” “Wrong Em Boyo” 8th March Capitol Theatre Passiac New Jersey live in 1980, Plus Blockhead Mick Gallagher on keyboards. dub legend Mikey Dread and two encores.